Posted on 15, July 2016 by EuropaWire PR Editors | This entry was posted in Education, Environment, Science, United Kingdom and tagged Dr Lennart Bach, energetic costs and benefits of calcification in the modern ocean, Professor Ulf Riebesell, University of Bristol. Bookmark the permalink. 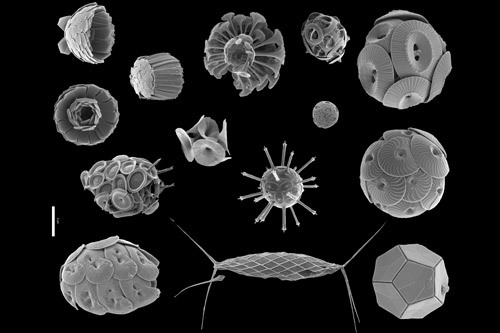 An international research team, including the University of Bristol, has calculated the costs and benefits of calcification for phytoplankton and the impact of climate change on their important role in the world’s oceans. BRISTOL, 15-Jul-2016 — /EuropaWire/ — Single-celled phytoplankton play an important role in marine biogeochemical cycling, in marine food webs and in the global climate system. Coccolithophores are a particular group that cover themselves with calcium carbonate shields, known as coccoliths. Some wrap themselves in an impenetrable coat of coccoliths, some make coccoliths in the form of sharp spikes, some perhaps use them as parasols against the sun and some form funnel-shaped light collectors. But this requires a lot of energy – and the price for the artful armour could rise further due to global change. With the help of a new model, the researchers analysed the energetic costs and benefits of calcification. The results, published in the current issue of the journal Science Advances, suggest that the ecological niche for calcifying algae will become narrower in the future. To better understand the purpose of the elaborate armour and assess to what extent they will suffer the consequences of global change, researchers from Germany, Great Britain, France and the United States combined results from evolutionary history and cell biology studies, laboratory, field and modelling experiments. So far, the high energetic costs have paid off. Professor Riebesell said: “Coccolithophorids have survived over 200 million years. But now it is questionable whether they are also able to withstand climate change. The 200 coccolithophore species produce up to ten per cent of the biomass in the oceans and keep the marine carbon cycle running. Stuck to their calcium carbonate platelets, organic matter sinks to the ocean floor – allowing surface layers to take up a new carbon dioxide from the atmosphere and process it. Whether these unicellular multi-talented organisms will be able to fulfil their functions in the future, depends on how much extra energy they have to spend on calcification – and how their competitors in the food web react to ocean change. The amount of carbon dioxide dissolved in seawater is increasing due to fossil fuel emissions, with an associated decline in pH (ocean acidification). This slightly stimulates photosynthesis. On the other hand, the reduced pH hampers calcification. Dr Lennart Bach, second co-author of the study from GEOMAR, said: “Compared to other planktonic organisms, coccolithophores will find themselves in a disadvantage. Their decline would also have an impact on the climate system.